Disclaimer from the writer: The companies mentioned in this blog have not sponsored or requested the statements below. I’m not sponsored by any tobacco company. Nor am I suggesting that you smoke. Smoking most certainly is NOT healthy. If you choose to smoke that is your choice and the consequences of that choice are your responsibility. Buying cheap cigars online comes with consequences. Alright, now that we’ve got that out of the way…I believe it is a widely accepted fact that smoking is bad for your health. But with that being said many of us, myself included, like to live on the edge occasionally and enjoy a good cigar without selling off valuable assets to get one. Cigars can be incredibly expensive. If you’re one of those folks that likes the occasional smoke without breaking the bank, you’ll want to keep reading. Several years ago, smoking a cigar that wasn’t purchased at a gas station or local pharmacy was, for me, a rare occasion. I loved good cigars, but, as many of us, my budget simply could not afford to keep a humidor stocked with them. A friend recently turned me on the the first online cigar shop that I will mention in this post – JR Cigars. JR turned me on to the world of buying cheap cigars online. This site has an incredible selection of cigars at great prices and for those who want a little education about the world of cigars, they offer JR University. JR University gives the customer a crash course in everything from wrappers to cigar storage and cutting to cigar aging. It’s incredibly informative and if you’re a novice I highly suggest it. Now that you know your stuff, you’re probably ready to make a purchase. But there are a lot of options on what to put in the checkout cart. Handmade, machine made, 5 packs, samplers, etc… Those are great. Browse leisurely. But if you already know the type of cigars you like I’d skip to the JR alternatives. These cigars are special orders by JR from the factories of makers like Arturo Fuente, CAO, Macanudo, MonteCristo, NUB, Perdomo, and Punch. I could keep naming them but it would just get ridiculous. Prices range $30 – $50 for 20 cigars. That’s utterly incredible. Do the math. 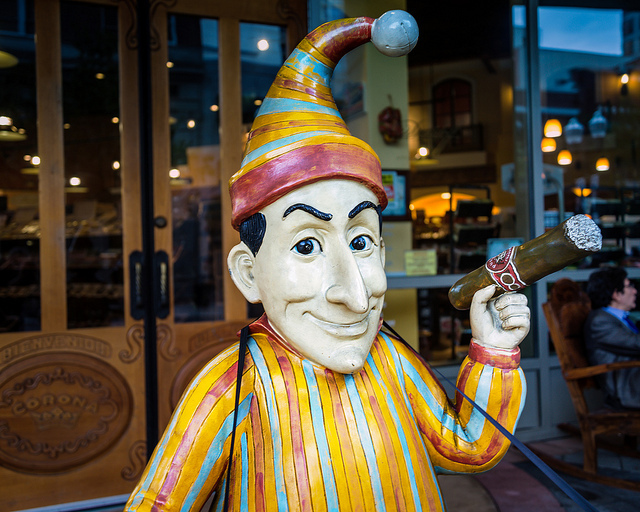 The last time I walked into a store to buy a decent cigar I paid $7 – $10 each. If you want cigars for an upcoming bachelor party or something of the sort, these 20 packs are a great budget choice. It’s also a good option if you have friends to split those stogies with. CAO Maduro Robusto is one of my personal favorites. I’m a singer in a band and that forces me to enjoy my cigars when I’m not on tour and in extreme moderation. That means that purchasing 20 cheap cigars online at a time isn’t the best choice for me (yep, even though they’re cheap). Still, I don’t want to pay a lot for my vice. While on tour I heard some commercials via satellite radio for this next company. 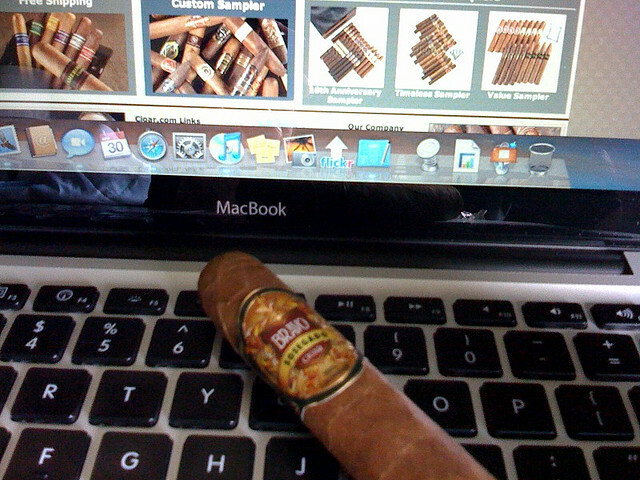 Famous-smoke.com is another one to check out if you’re a cigar aficionado. This 75 year old company has incredible deals on your favorite name brands. Not to mention the constant coupons that they offer via their email newsletter. A customer can browse by country of origin, manufacturing technique, samplers, 5 packs, 6 packs, 10 packs, boxes, brand name… the site is an exhaustive search engine for your favorite pastime. They have great sales on E-Cigars/cigarettes, humidors, and the works. I recently picked up a Brazil made 6 pack including Oliva, CAO, for $25. You’ll pay a little more here, but you’re still beating the price at many of your local shops. In my experience these companies have excellent customer service and prompt shipping. I’ve never had any issues with them. Please enjoy these deals conservatively and responsibly. Experience is priceless. These online stores are great when you want to order in bulk. What happens if you only buy from them though? Your local cigar purveyor goes belly up, that’s what. You know Joe, Joe is a great dude who loves cigars (and probably the totally awesome craft beer that you might be brewing). He knows a lot about cigars and you should support him. If you smoke, I suggest you get to know the “Joe” in your neighborhood. He’ll direct you in good paths of smoking enjoyment and you have the chance to help him put his kids through college. You should talk to “Joe” about the companies I’ve mentioned and find out what he thinks about their deals, maybe he’ll do a price match! Sometimes, you never know where or how you can save if you don’t ask. Update: My buddy Craig is an avid cigar smoker and also likes to score them on the cheap. Here’s what he says about his favorite website to score deals on cheap cigars. Now this is like going down the rabbit hole, once you discover this be prepared to spend a bit more then you anticipated each time. Cigar Bid, which is owned/run by Cigars International, is like Ebay for cigars. The inventory is huge! I can grab the Nicaraguan Gordo 2nds I like (basically nub cigars that didn’t pass) for about $22 w/ shipping for 15 cigars. Cigar 2nds taste the exact same as the firsts. If smoking a cigar is something you enjoy then I hope these tips save you big money! GREAT post. I use to buy seconds from a friend who is now deseased and I didn’t know where to look. Thanks Danny. Good luck saving! The auction sites like cigar bid and cigar auctioneer are good for deals. You just have to keep your head while biding and not pay more than retail. I have seen more than a few auctions where there is a bidding war and they end up paying more than what CI is charging on their main site… Cigars are like a lot of things in life, you get what you pay for… Be careful with the lure of cheap cigars and make sure you are buying cigars worth smoking. I have posted a couple of articles about cheap cigars and best cigar brands for beginners. Awesome guide! Definitely loved reading your post, this is so perfect especially for those who want to save money on a small little luxury! Thanks so much for sharing!